Honeybush Herb is part of the large legume family. Honeybush is native to South Africa. Honeybush Tea is naturally sweet and smells like honey. Honeybush Tea is similar to Rooibos Tea in regard to its origin and fermentation process. Honeybush has no caffeine and has very low tannin content. 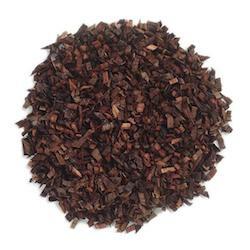 Honeybush Tea's appearance is gleaming, mahogany brown leaf granules. Honeybush Tea's tea-like aroma and flavor are distinctly floral. Honeybush Tea's amber-colored brew has great clarity. Honeybush Tea does not turn bitter if simmered for a long time. Some of the other active compounds in Honeybush Tea are cinnamic acids, flavones, isoflavones, isomangiferin, mangiferin and xanthonoids. Honeybush helps to regulate the menstrual cycle and prevent breast cancer, prostate cancer and uterine cancer. Honeybush is also used to increase milk production in breastfeeding mothers. In conjunction with Mom getting enough probiotics, Honeybush can also help relieve colic in breastfeeding babies.